Javea lies in the valley of the Montgo Mountain which separates Denia to the north. 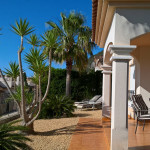 Javea has become one of the most popular resorts of the region. Javea is divided into a three part triangle Javea Pueblo to the north. Javea Puerto to the east, and Playa de Arenal. Javea Pueblo. The old town centre of Javea is beautifully preserved with medieval sandstone carved buildings. Located here is the Town Hall, the magnificent church of San Bartolome and the local Market offering fresh fish, fruit and vegetables. Javea Port. Still functions as a fishing port with private yachts moored close by. Alongside is a lovely promenade with local bars and open air terrace restaurants with stunning views across the bay. Playa Arenal. Javea’s, golden sand beach with its wide promenade and numerous restaurants, café bars, shops and boutiques.